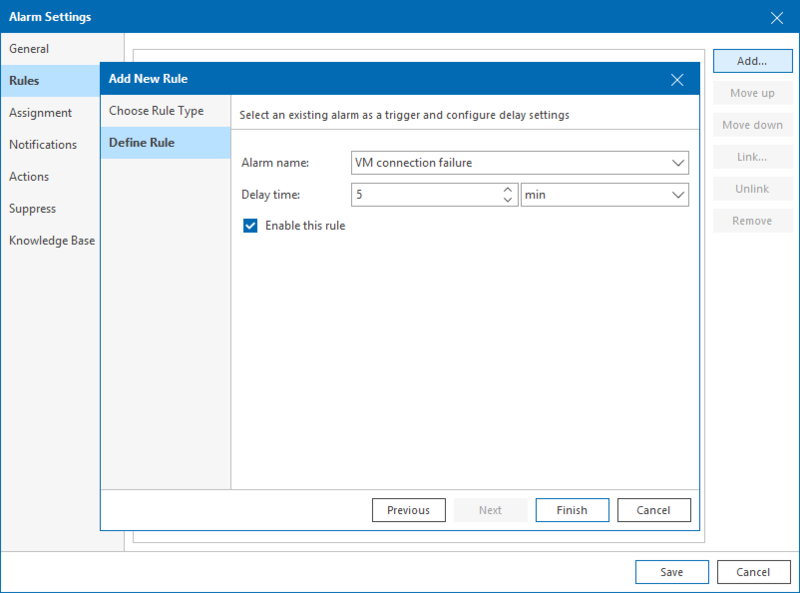 You can add to an alarm rules that are based on existing alarms. These rules alert if the specified alarms trigger or change their status. At the Choose Rule Type step of the wizard, select Existing alarm. In the Alarm name field, specify the name of the existing alarm that must trigger an alarm. This can be a predefined or custom alarm. For a list of predefined alarms, see the Appendix A. Alarms section. In the Delay time field, specify the period that must pass between triggering the source and the target alarm. You can specify the delay time in minutes, hours, or days. Repeat steps 1–4 for every alarm-based rule you want to add.